Some examples of the code can be seen above; a larger version of the image can be found here. The origins of the code, like the etymology of the term “hobo” itself, is unknown. But we do know that these images were adopted as an informal standard among the hobo community, loosely affiliated as it is. Many of the images make intuitive sense — the picture of a train suggests that the area is a good place to catch a train, for example. Others make sense with some explanation, such as the two interlocking rings which warn that police are in the area; the rings are intended to represent handcuffs. The origins of others are likely lost to modern eyes. Over time, we’ve lost the meaning to many of the symbols, even though they can still be seen in some places. 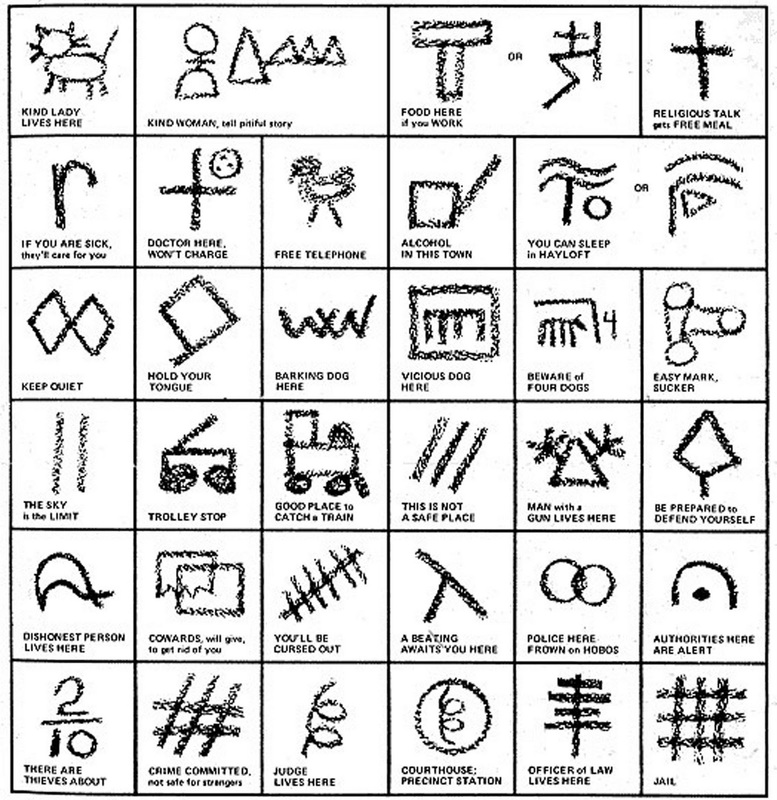 For example, Wikipedia has a photo, here, of a ferry crossing in New Orleans which has what appear to be hobo code signs — ones which have not yet been translated. Bonus Fact: One other way hobos create a sense of community? The National Hobo Convention. Each year, self-proclaimed hobos such as “Connecticut Shorty,” “Slo Freight Ben,” “Grandpa Dudley,” and “Bo Grump” gather in Britt, Iowa and elect themselves a King and Queen, although it is unclear at best to what the honorific entitles the victorious candidate. From the Archives: Hug Me Dot: The secret code of Mensa conventions. Related: A book of hobo code poems. It only has three reviews and two of them say the book stinks, but … it’s a book of hobo code poems, and the fact that it exists all but requires a mention, right?